My brother George sent this picture a couple of weeks ago. 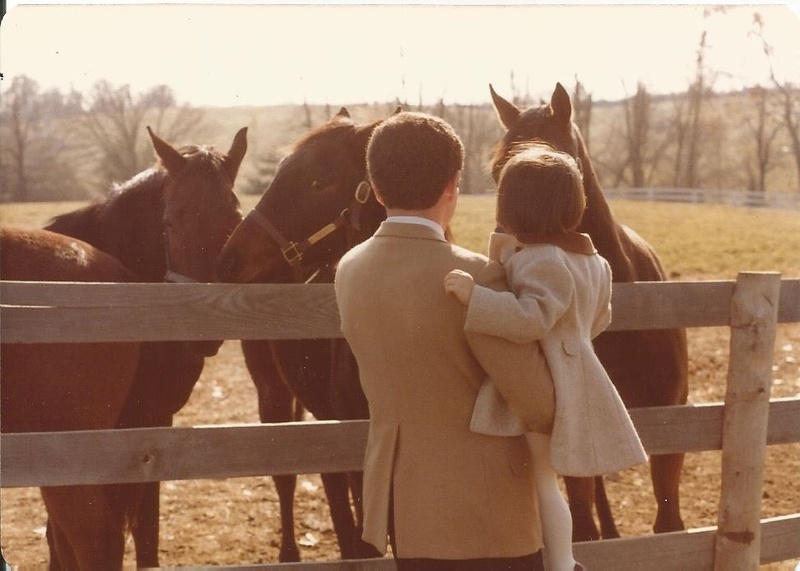 He’s holding my daughter Mary at a Virginia horse farm on an autumn Sunday in 1980. She was three years old at the time, a delightful child, full of wonder, who would die by intentional overdose fifteen years later. It was a question without answer, an insistent probe into the reality of my daughter’s life. In early grief, that sweet, innocent picture of Mary would not have seemed sweet and innocent. It would have called into doubt every good quality she possessed throughout her life. It would have prompted me to read the ugliness of her suicide back into the beauty of that picture-perfect moment. It would have left me grappling with the fear that, at depth, life makes no sense. An essential part of healing after suicide is that of reviewing one’s relationship with the deceased and exploring how it can be “disentangled from the manner of death . . .” clinical researchers John Jordan and John McIntosh advise (Grief After Suicide: Understanding the Consequences and Caring for the Survivors, New York: Routledge, 2011, 200). Disentangling Mary from her suicide required the discipline of many years: clearly the most arduous inner housecleaning of my life. But it finally gave my daughter back to me in a healing, peaceful way. Even more, it allowed the beauty of her life to return in its fullness. “These two 17-year-olds were athletes and students at one of the finest, most affluent high schools in our region,” writes Petula Dvorak. “They had families, friends, a future. Losing them to suicide . . . seemed unthinkable.” While one boy died on Monday and the other on Tuesday, officials considered the two deaths unrelated. I followed this story online as readers began posting comments about it. I expected a barrage, because reader comments on the Post website can number in the thousands for provocative news stories. But after an entire day, only 17 people had commented on Dvorak’s column. The silence seemed respectful more than anything else. The most incisive comment following the Post column took issue with the notion of suicide as unthinkable. “That headline is out of touch with reality,” one reader remarked. “You can’t call teen suicide ‘unthinkable.’ . . . Acting like teenage suicide, or any suicide, is unthinkable isn’t going to help us. It is thinkable. And we can do a much better job of helping people open their minds to other options” (The Washington Post, online Feb. 6-7, 2014). When my teenage daughter Mary died by suicide in 1995, her death was unthinkable to me and everyone who knew her. But it was thinkable to her; she’d been thinking about it for two years as her journals later revealed. I used to agonize over Mary’s ability to conceal dangerous thoughts and my inability to read them, just as I imagine the families of those two high school students are agonizing now. Yet, psychologist Kay Redfield Jamison offers this insight from her experience as a suicidal teen: “Because the privacy of my [suicide] nightmare had been of my own designing, no one close to me had any real idea of the psychological company I’d been keeping. The gap between private experience and its public expression was absolute; my persuasiveness to others was unimaginably frightening” (Night Falls Fast: Understanding Suicide, New York: Alfred A. Knopf, 1999, 6). Yes, we must do a much better job of helping people open their minds to options other than suicide. Before we can do that, however, we have to know that suicide is an option under consideration, and that’s sometimes far from clear.